Most homes today have at least one small bathroom, and many older homes have more. Yet, small bathrooms don’t have to feel small. With the right colors and flooring choices, you can design a tiny bathroom to make it feel more open and welcoming. Tile’s inherent water-resistance makes it a smart choice for any bathroom floor. Additionally it’s highly customizable, making it an excellent choice for smaller areas because its installation can be tailor-made to meet any space’s needs. In general, lighter colors will open up a room and darker colors will make a space feel more cave-like. 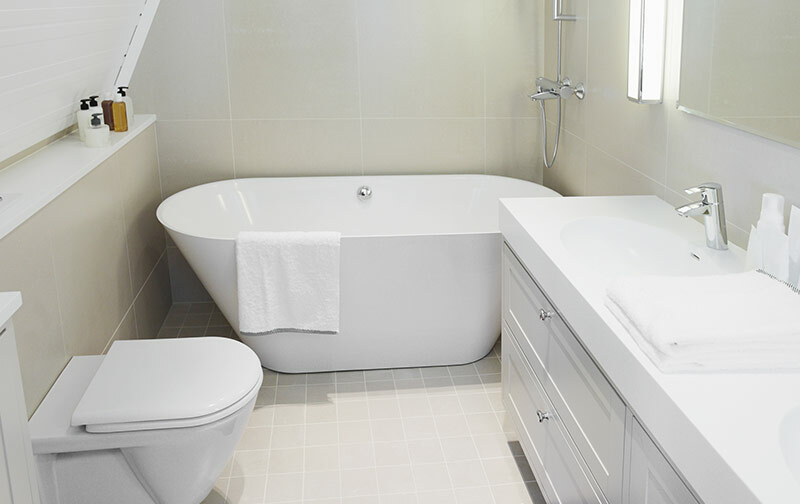 Stick with flooring in white, off-white, or any other light colors to make your small bathroom feel more spacious. Diagonally-laid tile fools the eye. Subconsciously, our minds count boxes when installed in a standard grid, but when the same number of tiles are placed diagonally, your eyes won’t be able to quantify the total as easily, which will help your bathroom feel larger. Larger tiles are a great choice to make small bathrooms feel less claustrophobic. The smaller the tiles, the more the grout lines, and too many grout lines will emphasize your floor’s grid. Larger tiles require fewer grout line, and the size of the tile will translate directly into how big the space will feels. But, don’t go overboard. Be mindful not to pick tiles that are too big. When flooring tile in a small space is disproportionately large, it can overwhelm a bathroom. In small bathrooms, picking out a grout to match your tile will make a big difference. That’s because contrasting grout produces a overpowering, grid-like look. When it comes to small spaces, you’re better off using a grout that is the same color as your tiles, whether they are large or small. Light gray grout works well with multi-colored glass or stone mosaics, and neutral grout compliments and punctuates multiple colors nicely. Whether you're looking to use tile to make a small bathroom feel bigger or if you just want to shop the best flooring options available, Kermans Flooring is a great place to start. Make an appointment for a free design consultation today. Make the best decision with our tile flooring buyer’s guide.